The author of I Love You, Beth Cooper returns with an ingenious contemporary satire set in an alternate universe populated by the aliens, mutants, and atomic monsters of B-movie legend. It came to Earth . . . and now its spawn goes to high school. Earth has survived repeated alien invasions, attacks by hordes of mutants, and the ravages of ancient beasts brought back to life. Now we’re in the blissful future…for most. J!m, the son of the alien who nearly destroyed the planet, is a brooding, megacephalic rebel with a big forehead and exceptionally oily skin. Along with Johnny, a radioactive biker ape, and Jelly, a gelatinous mass passing as a fat kid, J!m navigates a particularly unpleasant adolescence in which he really is as alienated as he feels, the world might actu-ally be out to get him, and true love is complicated by mis-understanding and incompatible parts. As harmless school antics escalate into explosive events with tragic consequences, J!m makes a discovery that will alter the course of civilization, though it may help his dating life. Replete with all the rock ‘n’ roll, hot-rod racing, and heavy petting of classic teen cinema—and packed with famous film-monster cameos—Go, Mutants! is fun strapped to an atomic rocket, and Doyle’s deadpan delivery and razor-sharp wit will have you laughing out loud before he even starts the ignition sequence. Why did we read this book: Funny story, actually. Thea initially had this book highlighted on her BEA calendar as MUST GET OR DIE – based on the awesome synopsis and sweet cover. Ana wasn’t really interested…until she saw the line for the book, saw the awesome cover, and read the blurb too. Thus, both armed with autographed copies, the two book smugglers vowed to do a joint review for the book – and soon, given the release date. Thea: If this were a job interview and I had to describe Go, Mutants! in three words, they would be: Bizarre. Neato. Diabolical. Well, it’s also nostalgic, a sweet mashup/homage to B-movies and classics (both of the horror and teen angst variety), hilarious, and raunchy good fun. (I was never good at the three words question) While Go, Mutants! does have its drawbacks and falters in its delivery, at times trying too hard (and there’s nothing more square than trying too hard, daddy-o), overall, the novel succeeds in its own weirdo, radioactive kind of way. Ana: Thea you so crack me up, but yeah, I agree with you, babydoll. Ugh, sorry, I can’t do the back-to-the-60s speak but Larry Doyle can. And that’s what’s important. Although there is a certain unevenness feel to the writing (which I will address later) , the book is rollicking good fun, with characters I positively loved and some sequences that were pure genius – including the ending. Thea: Imagine a 1950s world in which aliens, mutants, and other assorted B-movie monsters are integrated into regular society. Imagine that these aliens, mutants and monsters are parents, teachers, and other taxpaying, law abiding citizens. And they have children – children that are going to high school, alongside human kids, getting into the same sort of shenanigans, going through the same pubescent awkwardness, sexual frustration, and angst. Go, Mutants! follows young J!m, the son of a feline extraterrestrial mother and a large-brained, matter-energy devouring father – a father that also happened to, ahem, try to destroy the world (unsuccessfully). J!m makes his way through high school in the manner of many teen boys – armed with a generous heaping of male ennui, tight jeans, and a impenetrable aura of brooding. With his friends Jelly (whom you may recognize from a classic film about an amorphous blob from outer space) and Johnny (son of the union between a beautiful blonde and her ape-captor), J!m walks the treacherous halls of High School – avoiding human bullies, dealing with awkward sexual urges, and, of course, falling in love. Of course, J!m has quite the family legacy to live down, making his journey through high school a little more complicated than the average teen’s – especially when the proverbial poop hits the fan, again, and J!m uncovers a truth about his family past that no one wants to believe. the monsters were lined up on Maple Street. It’s lines like this that make Go, Mutants! work – there’s this subtlety, this biting absurdism and sardonic wit. However, by the same token, there is a feeling of trying too much at times. The initial chapters of the book are a bit confusing, as is the general background for the novel. Getting into Go, Mutants! is not an easy thing, especially as the technicalities and history are so vague and covered with so much techno-jargon. It’s not really clear why so many people and creatures have mutated, nor is it clear what certain technologies are – and the overall impression is of one trying to be witty and absurdist, but not exactly succeeding. Gripes with writing style aside, the movie/tv/pop culture references were enough to keep me engaged and hungry for more. But, more importantly, as much as this is a science fiction/horror drive in special kind of a book, it’s also very much a book about its characters – which is where the book truly shines. 1) a certain vagueness with regards to what was happening to the world and a lack of specifics with regards to technical terms, etc. There is no info dump and the reader is just thrust in the middle of this alternate America. Whereas this is usually a good thing, I thought it was rather confusing at least in the beginning. Once I got used to it all, and got to know the characters, it was easier. Plus, something that happens in the end explains the use of language and I for one, found it AWESOME. 2) and from my own specific background. English is not my mother tongue and some of the language used is really, I don’t even know which word to use to describe but for example words such as “imbide”, “effervesced” and “obsolesced” were used in day to day language and I had to stop and think about them. Plus, I don’t feel I have enough knowledge of American culture to appreciate and “get” all the puns and all the movie/tv/pop culture references. For example, the Twilight Zone reference that Thea quoted above was totally lost on me although I am proud to say I think I got some others which definitely made it for a fun read – trying to connect all the dots. As I said, once I got used to the language and the zany execution of plot, I was completely onboard. More than the specific reference to pop culture though what I liked the most were all the political paranoia, the underlying themes of racism, prejudice and bullying all deftly dealt with by the author without being preachy. There is also a very, very clever, keenly cynical sequence about how the religions in the world reacted to the knowledge that we are not alone in the universe. Even though yes, I agree with Thea, it seems that the author is trying too hard to be clever and witty with regards to language and plotting, I have to say that the characters were awesome and just right. Thea: As I said before, Go, Mutants! is very much a character driven novel – it is because of the strength of its characters that the book really works as well as it does, especially in the face of some hit or miss writing. J!m’s story – as the teen that is living down his father’s infamy, his mother as something of an Oedipal nightmare, his unrequited love for neighbor (and intelligent popular girl) Marie, and his own bodily changes – is what truly made the book for me. I loved J!m’s sense of humor, his ability to stand up to those significantly stronger than himself, and his grappling with his own feelings of inadequacy (especially when it comes to Marie). And Marie, as J!m’s love interest and friend is more than deserving of his attentions. Hilarious, smart, sassy (in a subtle way), I loved Marie just as much as I did J!m. Then, of course, there’s the bevy of supporting characters – the funny, gelatinous Larry and tough guy Johnny as the two main standouts. There’s also the hilarious story of a girl named Sandra Jane and her enormous gazungas (and her own self esteem problems), a bully and his sister, and assorted others. Even the characters met en passant are fleshed out and genuine, adding to novel. I must say, I am very impressed. One final note worth mentioning here – I loved how overtly sexual the book is. 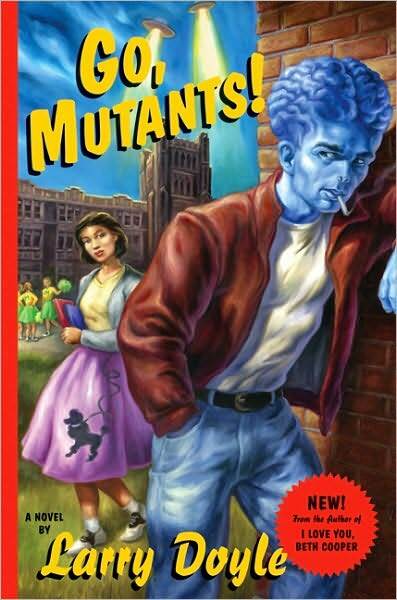 Not just because it goes with the tradition of the 1950s nostalgia that Go, Mutants! pays tribute to, but because these are teenage boys after all – and it really bugs me that so many YA books are sanitized of even the mentioning of sexual content. J!m – and the other characters in the book – are sixteen and horny (both guys AND girls). It’s refreshing to see that isn’t glossed over. Ana: Totally agree with Thea here – that’s where Go,Mutants becomes a darn good book. From the get go, I fell in love with J!m. Even as I struggled with the world he lives in, I saw the potential for this character from page one and Larry Doyle did not disappoint me. His arc was well done, and I felt sympathy, compassion, sometimes anger for the kid, as he struggled with being bullied, or just being a brooking teenager. Loved his sense of humour and his repartee with his teachers, friends and foes. And how much did I root for him to hook up with Marie? LOADS, that’s how much. The secondary characters were awesome too but I loved especially Johnny who was always there for J!m and J!m’s mother, a strong woman trying to raise her son and who did not put up with BS. Thea: Although I did have some roadblocks in my enjoyment of the book initially, the strength of the characters and the awesome shoutouts to classic films, television, and other sundries made Go, Mutants! totally worth it, for me. Definitely recommended to someone that like a little humor, old school horror/scifi mashups, and hormone-fueled romp. Ana: I really enjoyed Go, Mutants , in spite some initial reservations. Although I don’t think this is a book for every reader, it is definitely recommended to those who enjoy whimsical, humorous, character-driven stories. Or, if you like Douglas Adams or Mark Henry’s books or The Simpsons, you should be safe. Go, Mutants! has a freakin’ sweet website – with music, multimedia nostalgia, and lots of book info. We highly recommend you go forth and check it out. And in other big news, the book has been optioned for film by (so sweetly fitting) Universal. Here’s to hoping the film adaptation is just as enteratining as the book! Well, I read all the way through the review and I just cannot decide still if this is a book I would read. I’m stumped lol! Thank you for the great review but I think the real reason I might read this book is that I love that cover so much! It reminds me of a 1950s sci-fi movie poster. Uh, how do you pronounce J!m? I like the cover a lot, and with you referencing Douglas Adams, and Mark Henry AND the Simpsons, now I have to try and find it (if the book depository has it).